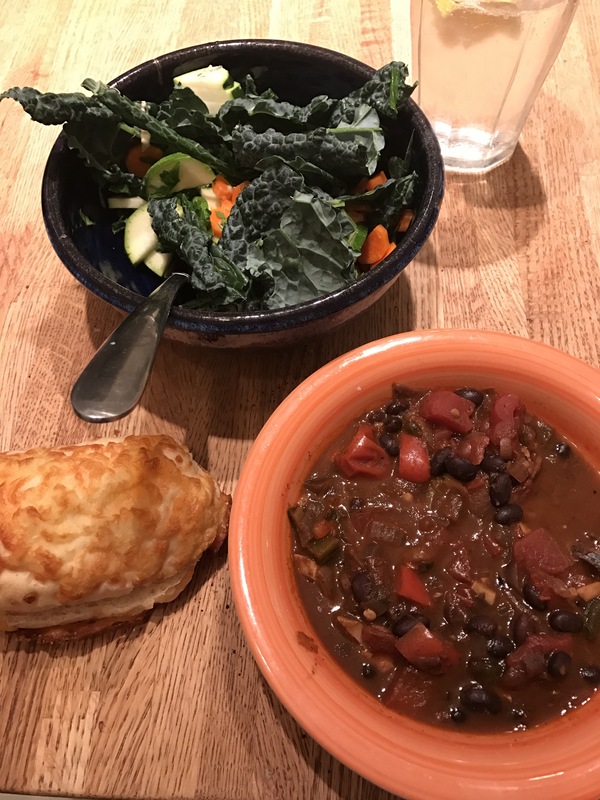 Sometimes the best meals are filling, familiar and fast. I feel that way about spaghetti and meatballs. It takes only a few ingredients (especially if you buy the sauce) and about 30 minutes from start to finish. 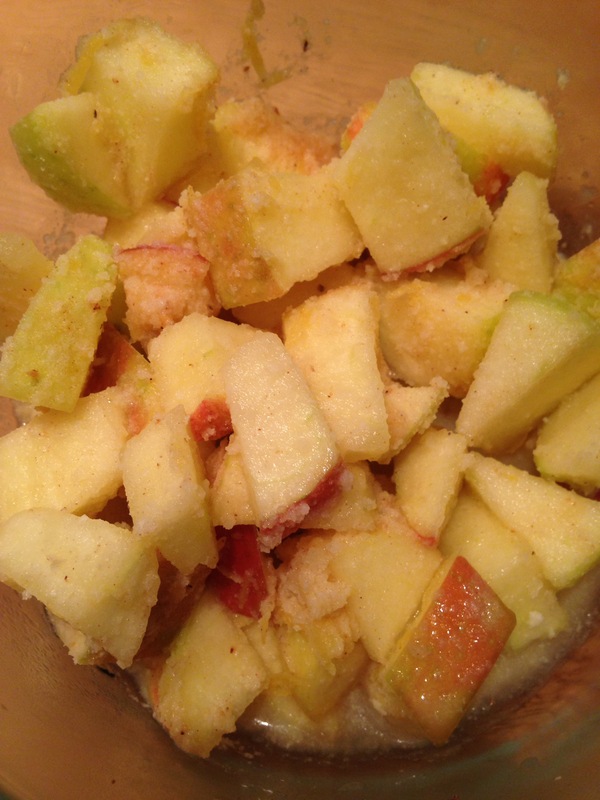 Place all of the ingredients in a medium sized bowl and mix thoroughly. 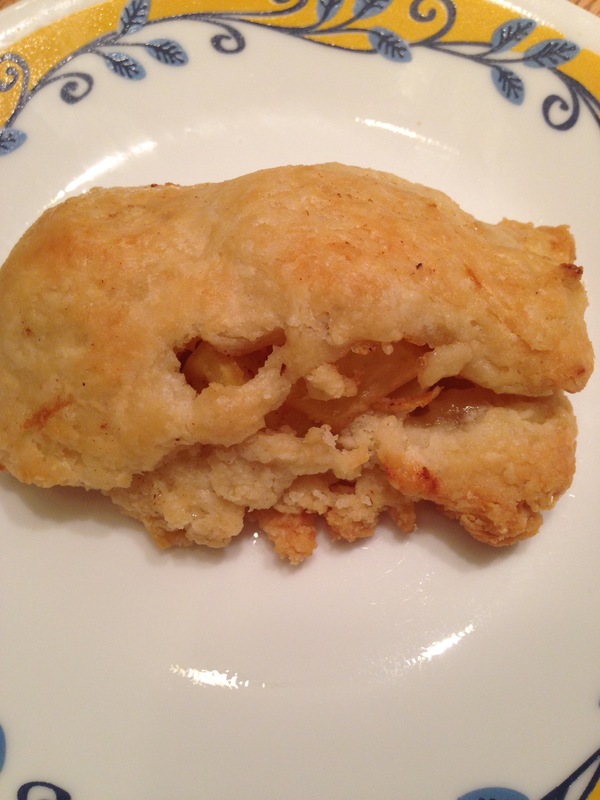 Then take a ping pong ball sized chunk of the mixture and roll it into a ball. Repeat until you have no more ground beef left. Turn a large pan with a rim on to medium. 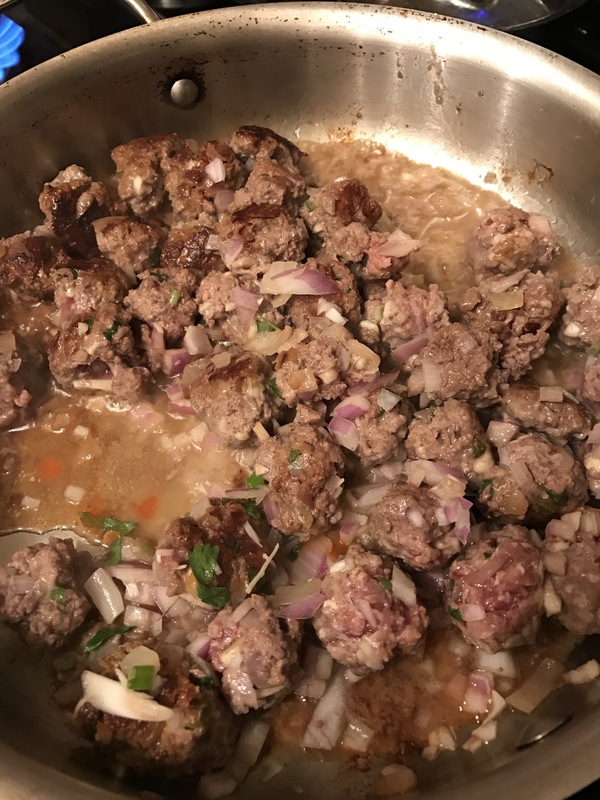 Cook meatballs, turning occasionally, until they are browned on all sides. Then add the sauce and cook briefly, stirring to make sure all the meatballs are coated with sauce. When the sauce is warm and the meatballs are cooked through take them off the heat. While the meatballs cook, heat the pasta water to a boil and cook the pasta to the desired doneness. Brown the onions in a pan on medium heat, add the carrots and Cooke for 2-3 minutes. Then add celery and allow to cook for 2-3 minutes more. Add garlic and oregano and cook briefly. 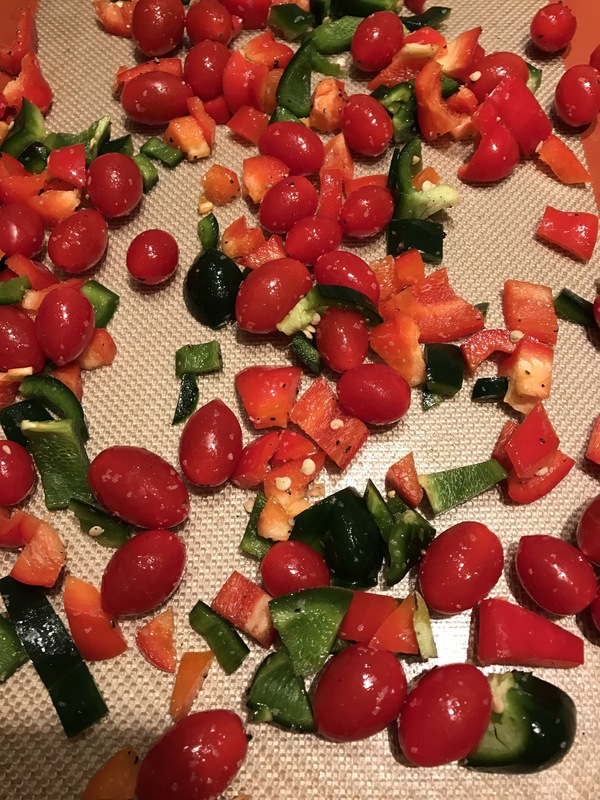 Then add the tomatoes and salt and pepper. Actually, I usually salt things a little bit with each addition but if you haven’t yet, add the salt now. Stir, then turn down the sauce so that it maintains a simmer. Summer for 30 minutes or so. If the sauce get dry, add a little stock or water. At the end you can either serve it as is or, if you have a kid like mine who doesn’t like chunks in his sauce, you can use an immersion blender to blend the sauce until smooth. 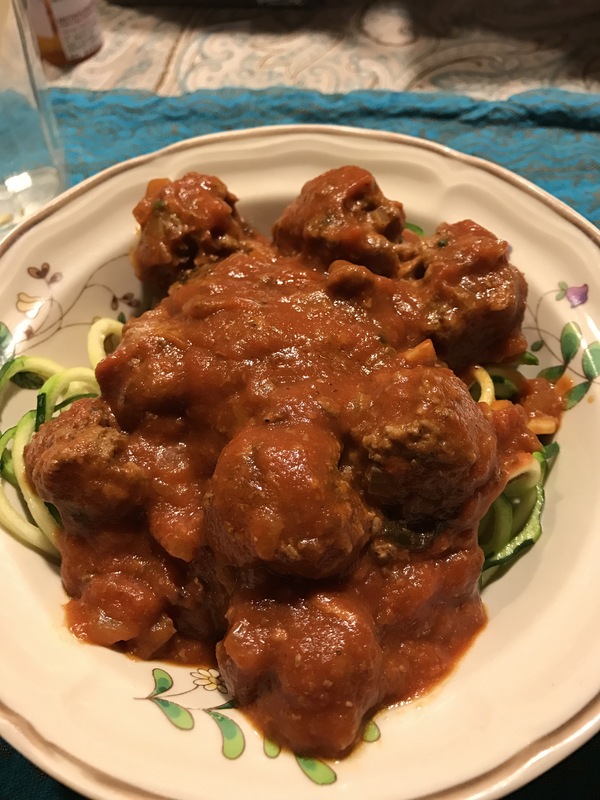 Serve the meatballs over pasta. Running hurts. It hurts because you are falling, over and over and over again, striking the ground with one foot and then the other. And then the other. And the other. If there are any weak spots in your body running will find them. Since I’ve started running I have had bursitis in both hips, plantars fasciitis in both feet, runners knee in my left knee, a torn labrum in my left hip, an s.i. Joint injury and now a neuroma in my left foot. And various scrapes, bruises and chafe marks. So, running hurts. But there are things that have helped me along the way to stay healthy. 1. Working on my core muscles. I didn’t really start to work on my core muscles regularly until last year. In October of 2015 something clicked and I started doing a regular core workout in the mornings. And it’s made a huge difference. I haven’t had bursitis since I started. I haven’t had any issues with my knees either. And my back is mostly good too– although sitting for too long does cause me problems. 2. Rest. I’m terrible about this but I know if I rested more regularly my feet would hurt less. 3. Slowing down. I’m terrible about this too. But sometimes I do it. I slow down. I accept that pain is my body’s way of telling me to take it easy. I try to remember that I don’t always have to push so hard, in my running and in life. That it’s ok to relax. I spent a lot of time last summer telling myself that it’s ok to slow down. It’s ok to just do what you can. It was really hard for me though. But back to that short workout I do most mornings. It’s evolved quite a bit since I started. It started on Cannon Beach when I was on vacation with Owen. I couldn’t run like I wanted to, so I decided to work out using intervals. I decided on a mix of push ups, squats and short runs. As I’ve gotten stronger, I’ve added to the number of push ups, swapped out the squats for clam shell exercises and added in planks. The workout takes me about 10-12 minutes and I do it 4-5 times a week. And I have seen a huge difference in my core strength and overall stability and balance. This workout is constantly evolving but I would really encourage you to consider finding a short workout you can do too. It’s a good way to start the morning. As soon as September comes around I start to think of knitting. Wool. Needles. Sitting quietly in my chair by the window, fingers in constant motion. It’s like a fever that comes on me. I yearn to knit. Does that sound strange? Perhaps melodramatic? If so, it is the truth. I yearn to knit. I start daydreaming about projects. Fantasizing about sweaters, mittens, hats and shawls. This year it was the Glasgow Sweater. It’s been staring at me from the cover of the Winter issue of Interweave Knits ever since it arrived. 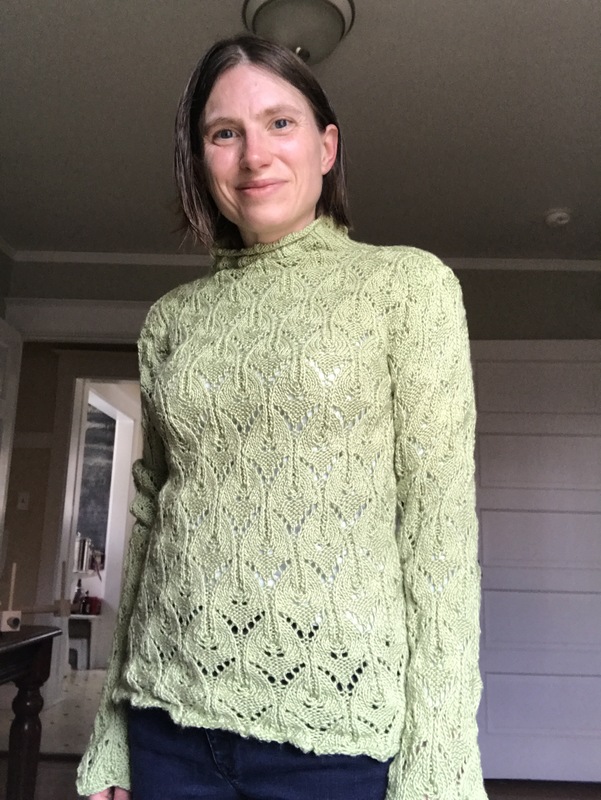 It’s cabled and slightly slouchy with a crew neck. Simple in construction but interesting enough to hold my attention during the hours I will spend making it. But it wasn’t on my list. The list in my head of projects that are upcoming. Some of the projects on the list are meant to satisfy my never ending quest to cover those I love in hand knit goods. Mittens for my boyfriend. Socks for my son. Some are things I have planned out and purchased the yarn for, but haven’t started yet. 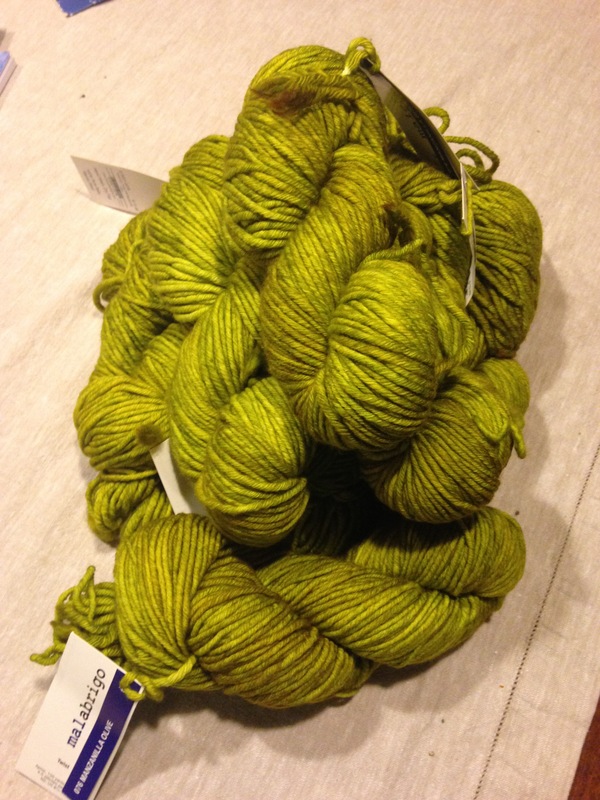 I couldn’t wait to wind a skein and start swatching, even though I had other unfinished projects. I got gauge on my first set of swatches. I was suspicious of this, but cast in right away anyway. 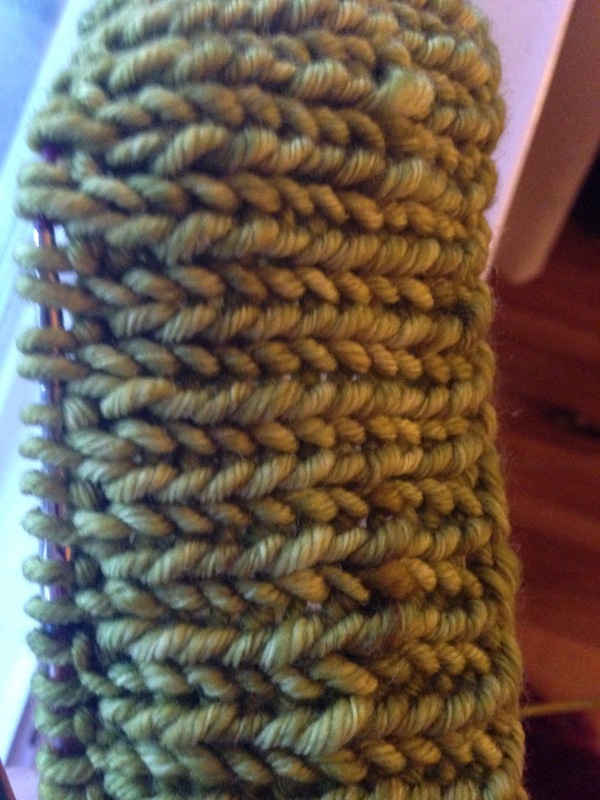 Once I was through the ribbing, the pattern section was easy to set up and easy to put down and pick back up again. It’s really the perfect project for me and for this time of year. The lead up to Christmas means that I am making lots of things for other people. Some of them will be knit, and some will be in other forms, but there is always a lot. 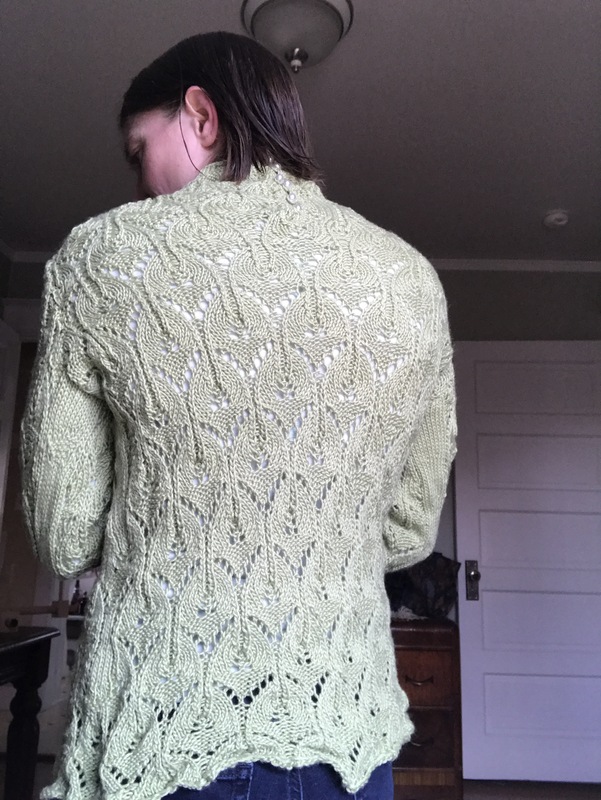 I need to be able to put down one project and work on another without losing my place in the pattern. In my overpacked life, full to bursting with things-I-must-do, this project provides the perfect distraction– enjoyable but not too demanding. That’s about 12″ of knitting. I love making mittens. They are fast and can often be made from leftover yarn in my stash. They are also endlessly variable– they can be cabled, have stranded colorwork or intarsia, be thrummed or plain. They make great gifts here in the frozen Spokane winter. 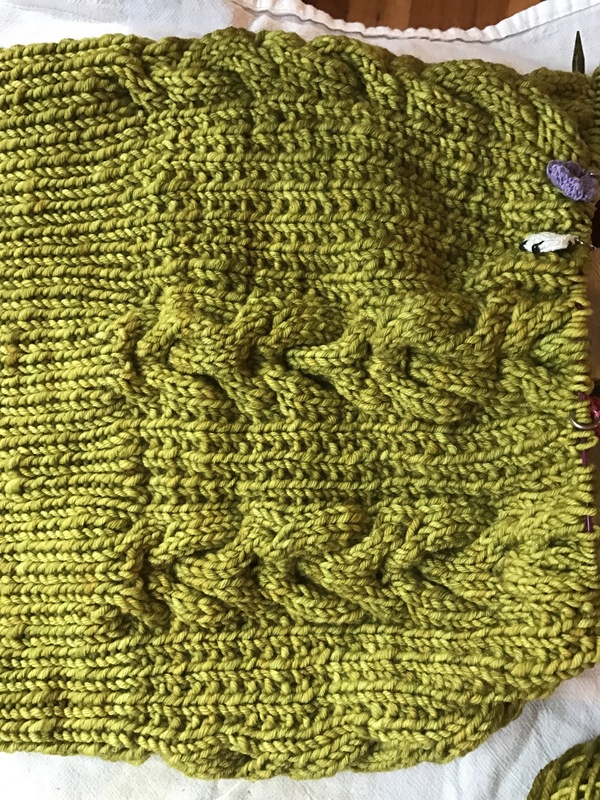 Once I have my measurements I figure out how many stitches to cast on: wrist circumference x number of stitches to the inch (as determined by swatching.) so, if the wrist circumference is 7″ and the number of stitches to the inch is 8 then I would cast on 56 (because 7 x 8 = 56.) inthen work 1 x 1 ribbing for about 2″. Then I switch to stockinette, and, at the same time, in the next round, I increase. 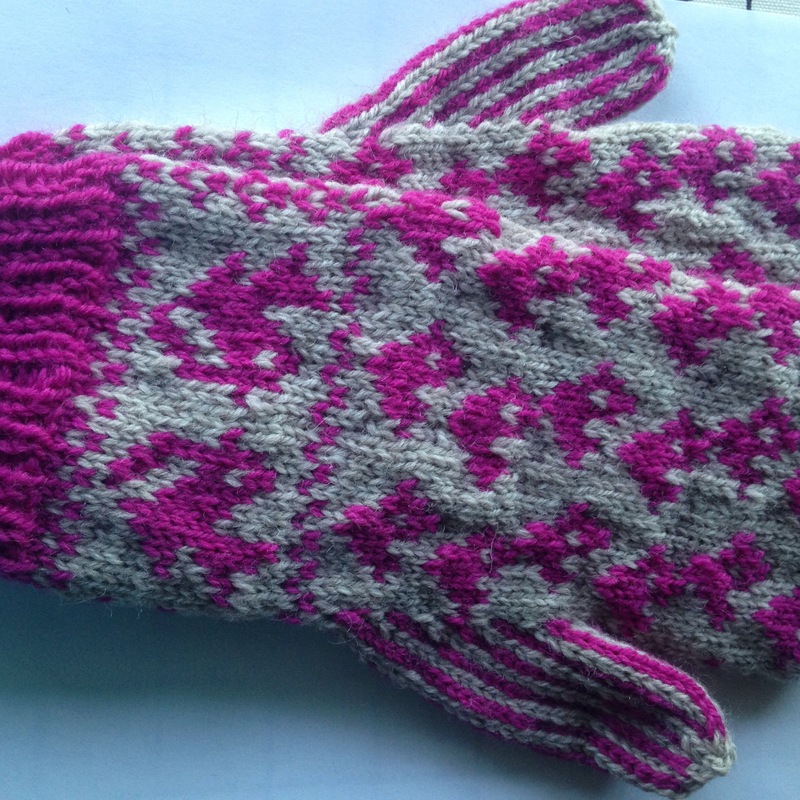 I increase as many stitches as needed to make the mittens as wide as the palm circumference, plus about 1/2″ or so. This is not precise, but you don’t want your mittens to be too tight. Then I usually like to throw in a little motif between the wrist and the start of the thumb gore. Sometimes I use patterns that I have (Latvian Mittens by Lizbeth Upitis is an excellent source of graphs and motifs) or Sometimes I chart my own. You can find downloadable, printable, knitters graph paper by googling. 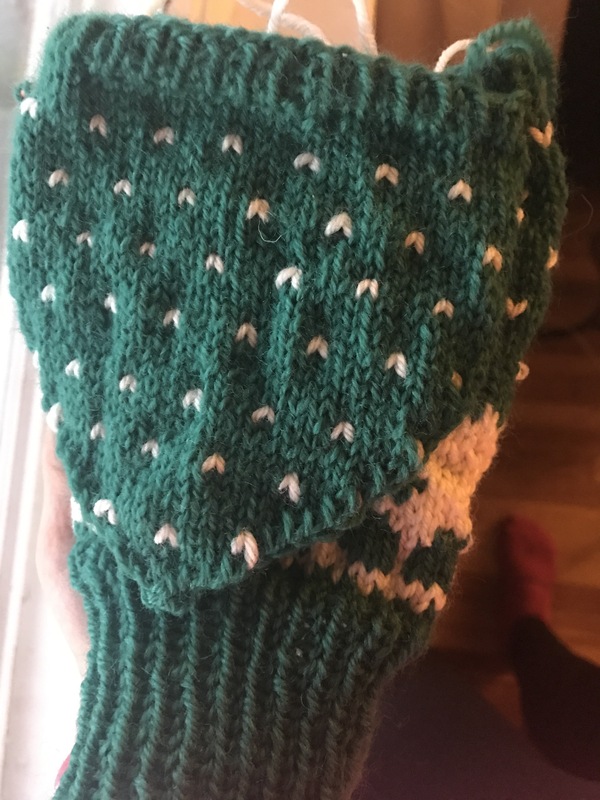 Once the mitten is long enough– once the length between the wrist and the bottom of the thumb is long enough, I start the thumb gore. And this is where you have to pause and put some thought into thumb placement. Where do you want any motif you have worked to sit on the hand? Is there a beginning, end or center? Just think about it and then make sure you place the thumb so that the mitten will have the center or the pretty part of the pattern facing up. This is how I work a thumb gore: once I have determined where to place the thumb, I place a marker, then I work a m1 increase, place marker. On the next round, I work the stitch in between the markers without increasing. On the round after that I: slip the first marker, m1, knit the already existing stitch, m1, slip marker. I continue in this fashion, increasing 2 stitches every other round, until I have the right number of stitches for the thumb circumference, plus 2 or 3 more, so the thumb isn’t too tight. Once the thumb gore is finished I move the thumb stitches to a holder. Then I work the remaining hand stitches until it is time to decrease. There are several ways to decrease, of course. My preferred method depends on the kind of mitten I am knitting. 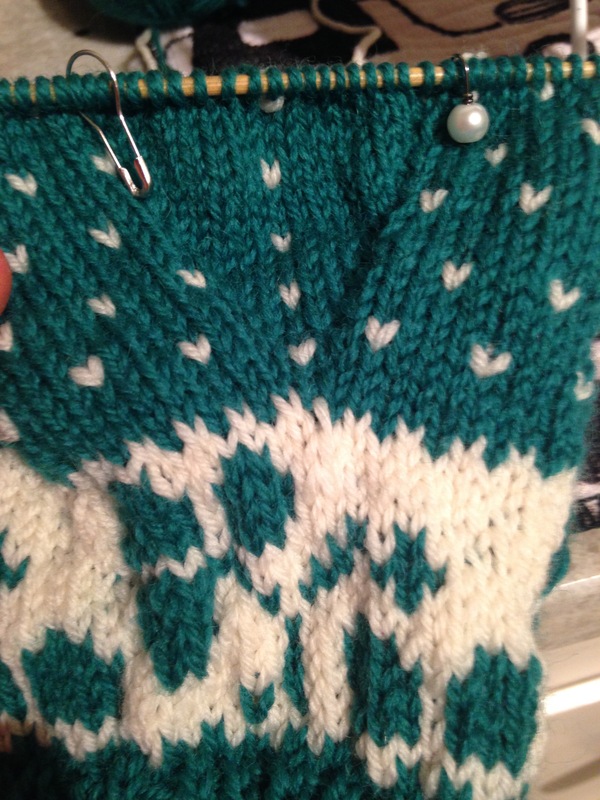 For color work mittens, I almost always decrease at the sides. To do so, work to 3 stitches before the first side of the mitten (where this spot is will be determined by where you placed the thumb), ssk, knit 1, k2tog, then I work to 3 stitches before the second side (usually the end of round, but it depends on where you put your thumb), ssk, knit 1, k2tog. 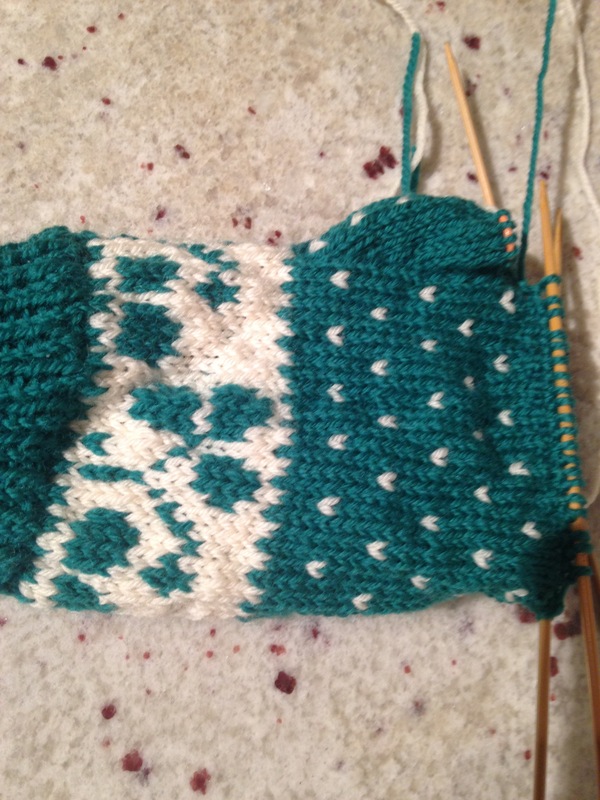 I work the decreases either every other round or every round, depending on how long the mitten needs to be. 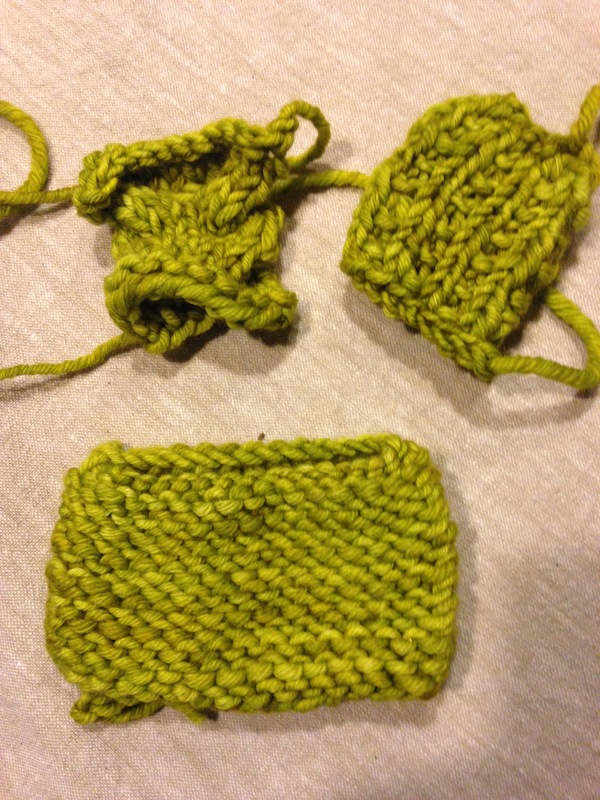 When I have 4 stitches left I cut the yarn and pull through the remaining stitches. 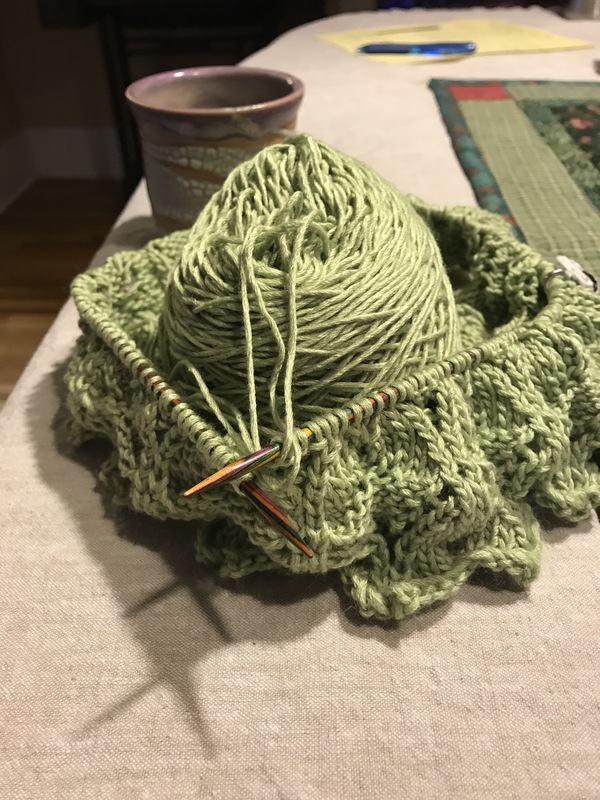 This decreasing method will allow you to keep working any color work pattern for most of the mitten. If you decrease in a circular pattern (like for a hat) the pattern gets wonky. The last thing I do is pick up the stitches for the thumb and finish it off. For the thumb I usually work a circular decrease since it’s such a small number of stitches. I used to hate eating alone. I used to hate being alone. After Owen was born I was never alone. When I wasn’t at work I always had him with me. I would get up in the morning and get us both ready and take him where he needed to go. When I left work, I would go straight to my mother in law’s house and feed him before we left to go home. Then my marriage ended. And suddenly I was living in an apartment and sharing custody of Owen. For the first time since he had been born I had whole evenings and days to myself to do what I wanted. And I really had no idea what to do with myself. I was like a wagon that had lost one of its wheels. One of the things that was most uncomfortable for me was eating alone. If I was in my apartment, sitting at the table alone at first felt strange and lonely. If I went to a restaurant I learned that sitting at the bar felt less like eating alone, even when I was. Over time my perspective has changed. I have come to really appreciate the nights when the only person I need to please is myself. And I have also found that I like my own company. Last night, Owen was with his grandparents for dinner, so I made a kimchi bowl with rice and tofu and sat down at the table and ate and it didn’t feel lonely or awkward. It felt joyful. 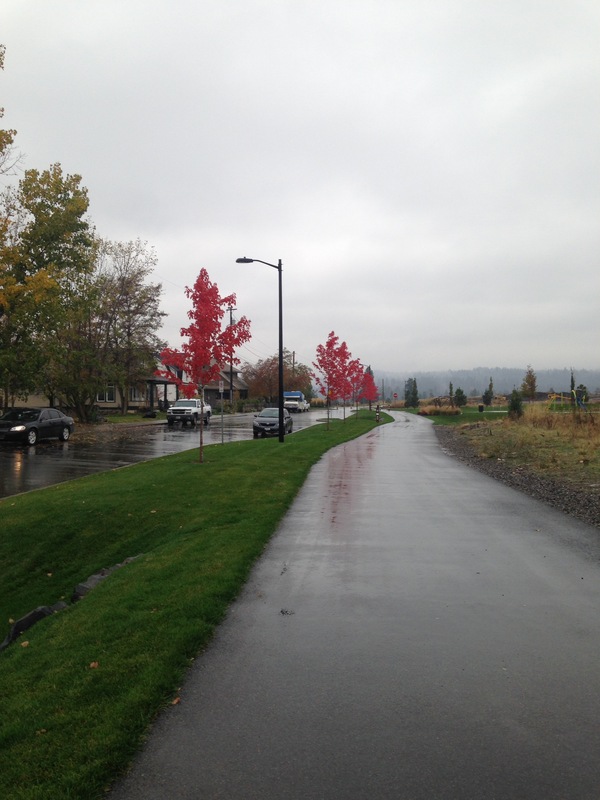 October is probably my favorite month to run. The temperatures are cool and it is usually dry. This year has been exceptionally wet– but the trade off has been that it’s been in the forties most mornings. October is a month that carries weight in my mind. Potential. It’s my birthday month and I always try to do something big, running wise. In 2014 I ran 14 miles on my birthday. That was the farthest I had ever run at that point. That was also the day I decided to run my first marathon. 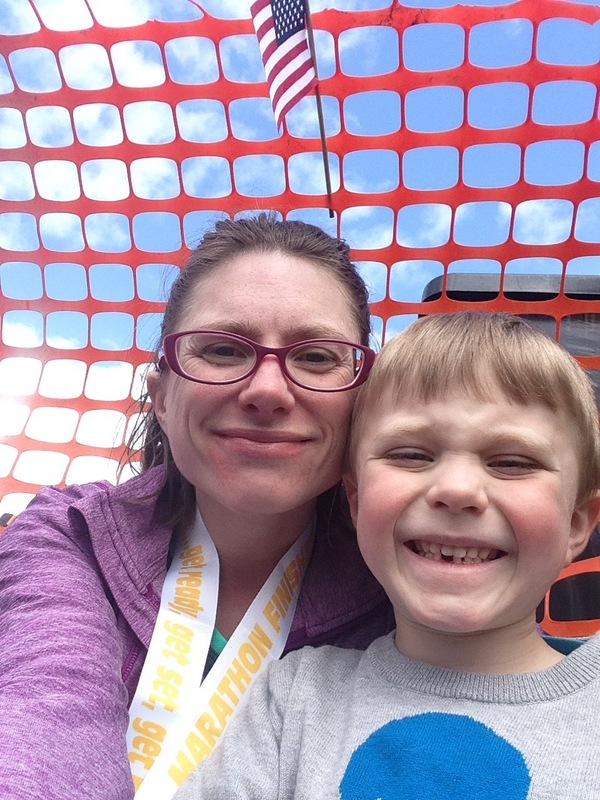 That marathon (in April, 2015) didn’t go as I had planned. 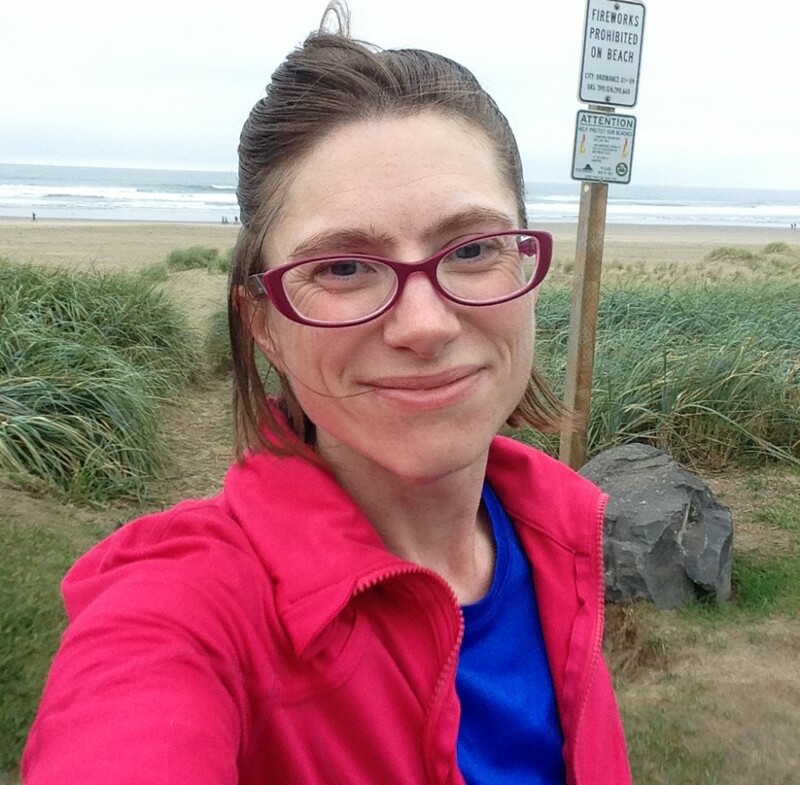 My training wasn’t what it needed to be and I went into the marathon injured, but I learned a lot from being forced to walk most of the last 6 miles of that marathon. 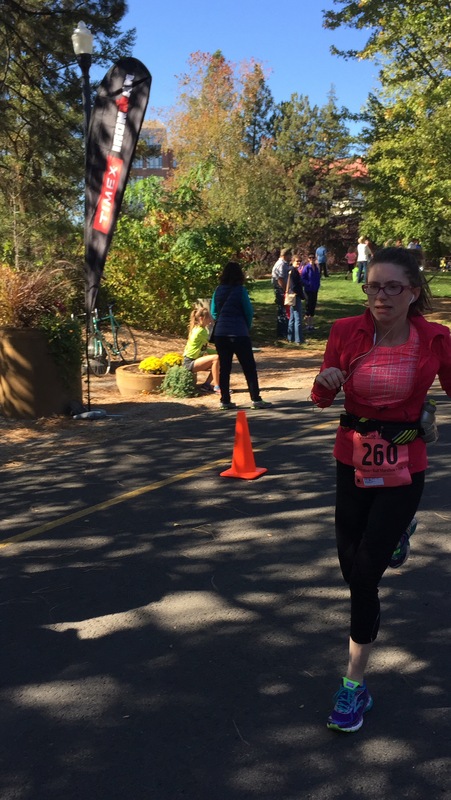 Last year I ran my second marathon in the month of October, and reached the goals I had set for myself: to run the whole marathon, run up doomsday hill (locates just past mile 22 of the Spokane Marathon) and finish in under 5 hours. I finished that marathon running, and knocked 43 minutes off my previous time to finish at 4:17:52. 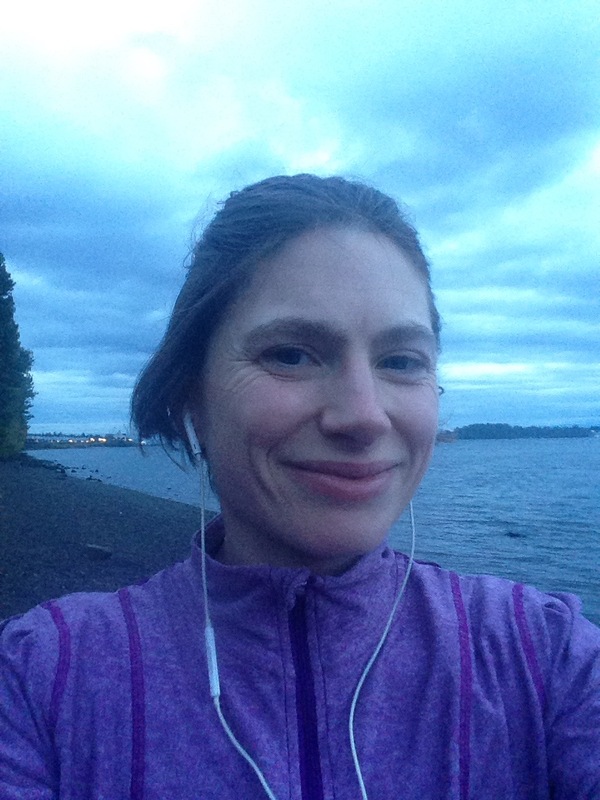 This year I thought about those big goals and even considered trying a long, long run. Or a high mileage week. Finally though, I decided to do none of things and give myself the space and the time to revel in the joy of running. I wanted to spend some time not pushing myself so hard every day to meet set mileage goals, and instead, run for the enjoyment of it. One of the things I struggled with all summer, as I battled anemia and pain, was simply putting one foot in front of the other. It was like staring down a solid rock face many days. I don’t regret continuing to run but I am glad that I am now well and the mental effort it takes to complete my runs is so much less. And the result of not pushing so hard? Running for the enjoyment of it? 133.8 miles in October.